Why do you have to pay Sweepstakes Taxes in the US? One of the important revenues for the government comes from the taxes paid for the sweepstakes by the sponsors. Since, it is similar to the lottery schemes the taxes levied are quite heavy though. Hence, the income amount is also quite substantial enough for the federal and state governments. It is hard to persuade them to evade these taxes that bring vital income to their treasury. How much do you have to Pay Sweepstakes Taxes in the US? There is a common myth that there is no tax money that is to be paid for those sweepstakes that have prize money worth as 600 dollars or less. In fact, it is not true. 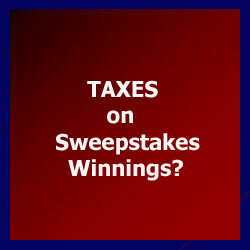 There are taxes for each and every other sweepstakes. The proportionate calculations are too technical and would vary accordingly as well. When do you have to pay Sweepstakes Taxes in the US? It would be deducted from your prize money automatically when you are the winner in some cases, and in some other cases the method varies though. Sweepstakes obligators will have to report the prizes to the IRS. The IRS instructions given along with the Form 1099, would clearly state the pertaining rules and regulations too. The winnings in the sweepstakes are to be reported mandatorily as other income. One of the members asked if we do you have to pay Sweepstakes Taxes in the US. It was really an important question that has to be answered in detail though. All the pertaining details should be known to all those participants in the sweepstakes mandatorily. In our next article will be talking about the possibility of a lump sum payout. Andre clegg want to win $14,000 a week for life. 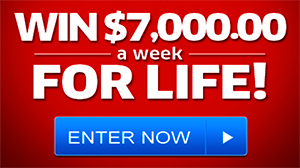 Andre clegg want to win $7,000 every week for life. Andre clegg want to win $5,000 every week for life. Andre clegg want to win$10,000 every week for life. Please make Andre clegg winner of all entries in pch. I would like to claim my PCH VIP elite exclusive guaranteed entry to win GWY.10074. I have receiving email from pch today and been searching it not have in there win it my name on list. :-/… Pleas help me. Thank you.